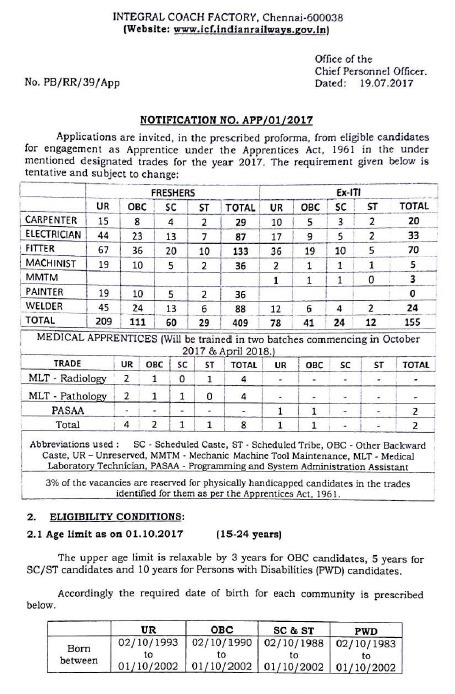 Integral Coach Factory, Chennai had released a notification for the engagement of Act Apprentices 2017. Through this notification, ICF had invited applications in prescribed performa for 574 Act Apprentices posts under the apprentice act 1961 for the year 2017. You can apply online up to 11 August 2017 via icf.indianrailways.gov.in. Age limit: 15-24 years as on 01.10.2017. Upper age relaxed by 3 yrs for OBC, 5 yrs for SC/ST and 10 yrs for PWD. 10th and National Trade Certificate by NCVT in relavant trade. Ex-ITI: The period of Training undergone in ITI shall be taken into account for the purpose of determining stipend rate. Application fee of Rs. 100 is needed to be paid online or fund transferred to the bank account given in notification. No fee for SC/ST/PWD/Women candidates. Candidates will be selected on the basis of marks obtained in Class X and / or ITI. Selected candidates have to produce Medical certificate in prescribed form. Candidates with higher qualifications viz. Engineering Degree / Diploma are not eligible to apply. The training will commence from 01 October 2017. 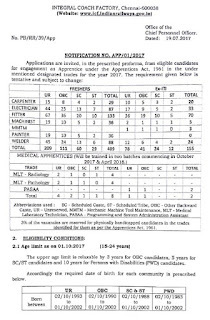 Eligible candidates can fill online application form via IC F web portal www.icf.indianrailways.gov.in and click the apprentices 2017 link. For all details, you should check out the ICF Apprentices Job notification from below.